One of the most important things about your theatre venue is your seating. If you want your audience to enjoy the performance, you want them to be comfortable and safe. Here are some theatre seating considerations. There is a huge range of seating options available to meet all theatre requirements, and one of the first choices you have to make is whether you can afford to spend a little more for luxury and high­?end seating, or whether you need to opt for budget seating. Budget seating doesn’t necessarily mean cutting down on quality. Asian manufactured seating compares very favourably with European and American rival products, in terms of both price and quality. It pays looking for a supplier who has strong relationships with leading manufacturers of theatre seating in countries like China, Malaysia and Vietnam. Unfortunately, not everyone makes it to their seats in time before the performance begins. Trying to find seats in the dark can be frustrating for the latecomer and other audience members, and a huge distraction for your performers. Consider using an illuminated seat numbering system to get your patrons to their seats safely and quickly. Look for seat numbering systems that use low­?energy LED illumination for minimal visual distraction and indetectable heat output. Seat numbering is suitable for any theatre, concert hall or other performance venue and is easy to add to your existing seating solutions. Once you’ve decided what kind of seating solutions you want in your theatre venue, you need to carefully plan to ensure you are meeting all building and safety requirements. Preparation is the key to success with nearly every venture. Theatre planning ensures your performance venue project is completed on time, and to your precise specifications. This is not the area to cut costs in. 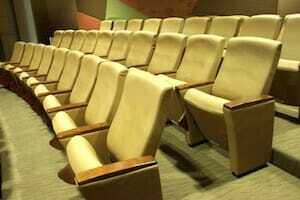 It pays to go with a professional and ensure your seating solutions are installed according to plan.